Some people call winter snuggle season. Others call it holiday season. We call it meeting-his-parents-for-the-first-time season. Whatever the season is, the fact stands: you’re going home with your beau this holiday to meet his parents. Nervous? We don’t blame you. Ready? No one ever is. But regardless of the nerves and thoughts going through your mind, take solace in the fact that you are not alone! Thousands of people meet their significant other’s parents over the holidays and guess what? Those same thousands survive the experience. Here are 8 ways to make the right impression and keep the meet and greet as stress free and fun as possible. 1. Think About Staying at a Hotel. Families are a source of love. But they can also be a source of friction. Especially around the holiday season. You create some much-needed space and privacy for your relationship. You ease yourself into your partner’s family atmosphere. Jumping in feet first by staying with the entire family may not necessarily be the best idea. The holiday season is stressful, fun, exciting, and difficult all at once. There is really no need to make it harder than it already is. 2. Discuss Time for Just the Two of You. It’s normal to want to spend time winding down with your partner after a long day of meeting Aunt Susan, Uncle Karl and the rest of the family. But it’s also possible that your partner isn’t keen on the same thing. It’s important to discuss expectations before you hit the ground running. This way you’ll minimize the risk for confusion and any resulting awkwardness. It doesn’t need to be extravagant or expensive, but it does need to be something. Flowers, wine, appetizers, toys for the kids, and so on. This shows that you respect your partner’s family’s invitation and appreciate their hospitality. It’s also a great way to make a good first impression. This creates intimacy. Sure, you might know that he is a “Cornhusker” from a farm in Nebraska, but what was that farm like? What was his favorite memory? What fields did he run out to when he and his dad argued? Those small details will create another level of intimacy for your relationship to grow. It also creates context. Knowing those small details about his youth helps you better understand and appreciate the front porch you heard so much about, or the street corner that gave him his chin scar that makes him so uniquely him. Before meeting the family, it might be a good idea to check out the town. Take a walk around and see where your partner came from. Talk about who you’re going to meet and what you’re going to experience. 6. Meet the Most Important First. During the holidays, names and faces are flying around like crazy. It’s totally understandable to get a little overwhelmed when meeting everyone. That’s why we think it’s a good idea to meet the most important people first. 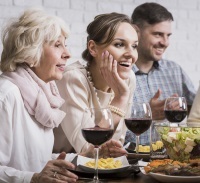 Whether that’s mom and dad, or a favorite cousin, meeting the ones closest to your partner will not only provide a sense of comfort when at the family event, but will give you greater insight into your partner’s upbringing and life before you. 7. Remember, You’re on the Same Team. Small things you never noticed before might start to bother you while the commotion of family holidays are in full effect. And we get it! You aren’t the focus for the time being. It can cause a little friction. But don’t let that friction distract you from reality: you and your partner are one. You’re a united team. Your partner brought you to meet the people he/she loves the most because you are incredibly important to him/her. 8. Email and Mail a Thank You Note. Your first impression with your partner’s family is an experience. And it doesn’t end when you walk out of the door. In fact, your first impression can be improved even more if you go above and beyond by emailing and snail mailing a thank you card. The same way a small gift upon arrival shows your gratitude, a thank you note afterwards does the same. Are you still looking for your significant other? Make sure to check out these dating sites reviews to find the perfect dating site for yourself.